Home WHAT ARE AIR SACS? The unique respiratory system of birds is affected by many different physical and environmental conditions. The functions of the air sacs that allow birds to collect oxygen so efficiently can also put them at risk in household environments. Birds are very sensitive to airborne toxins. This is why underground coal miners of the eighteenth and nineteenth centuries carried caged canaries. These birds died quickly if toxic gases were circulating in the tunnels. As a result of their highly sensitive respiratory systems, modern household environments can be similarly toxic to pet birds. Many common aerosol products can kill birds very quickly. Insecticides, cleaning products, fumes from Teflon cook-ware are some common causes of deaths in pet birds. Plug-in air fresheners and insecticides are also highly dangerous to pet birds. Recently in my own practice I have seen birds die from inhaling fumes of “spray-on” fake tan, fumes from glues during building renovations and one poor little canary kept in an air-tight bedroom, died from inhaling fumes from a well-known brand of aerosol deodorant. Pet birds can also suffer respiratory distress from pressure placed on their air sacs. A common cause of breathing difficulties is obesity. In fat birds, the liver becomes enlarged and unhealthy. Healthy liver cells are replaced by fat cells. Extra abdominal fat deposits and the enlarged, fatty liver push against the air sacs and reduce the effective functioning of these “bellows”. Other common conditions that compromise the air sacs and reduce their effectiveness in the respiratory system are tumours. Budgies are prone to ovarian, kidney and testicular tumours. These lesions fill up the body cavity and put pressure on the air sacs. Budgies with these conditions are usually presented with “breathing difficulties”. Birds that are egg bound or have retained eggs also present with breathing difficulties caused by a retained egg or an enlarged uterus putting pressure on the air sacs. Viral and bacterial infections can also adversely affect the functioning of the air sacs. These infections cause airsacculitis which changes the clear, transparent appearance of the air sacs tissue to an unhealthy, cloudy opacity. One of the typical symptoms of Psittacosis is cloudy, infected air sacs. A common problem in hand-reared baby birds is inhalation pneumonia. This occurs when some of the food is inhaled into the trachea and passes into the lungs and through into the air sacs. The inhaled food acts like a foreign body and causes a reaction within the tissue of the air sacs and the lungs. It is full of micro-organisms that enable bacteria and fungus to proliferate in the warm dark spaces of the air sacs. Countless kinds of fungus and moulds exist in the environment. Aspergillosis is a common fungal infection of the avian respiratory system. If this condition remains undiagnosed and untreated, fungal spores proliferate throughout the air sacs and lungs eventually causing death. Once diagnosed, antifungal medications and supportive care can be effective against aspergillus infections but these treatments are long term and involve regular checks to assess recovery. An understanding of the complex respiratory system of your pet bird can help you be more aware of common aerosol dangers and also aids in the early recognition of subtle signs of illness. The respiratory system of birds is different from all other vertebrates. Birds have a lot of “empty space” inside them to keep them light for flying. These “empty spaces” are filled with clear, “glad wrap” bags of air, the air sacs. When a bird breathes in and out, it is not the lungs that are moving. A bird’s lungs are static. It is the air sacs that move and pump oxygen through a complex bronchial network of a stationary lung. 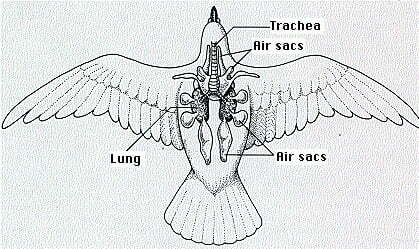 Birds have nine main air sacs that play an important role in respiration. The avian respiratory system delivers oxygen from the air to the tissues and also removes carbon dioxide. It also plays an important role in maintaining normal body temperature. The respiratory system of birds is fast and efficient. It’s all an adaptation to allow for maximal absorption and delivery of oxygen to enable a bird to fly effectively.